On the wild shore of the mystic island of Pulau Besar. 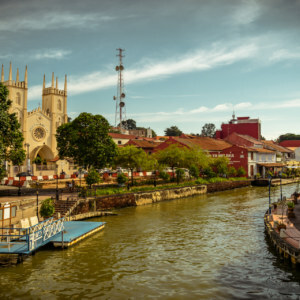 One of my stranger day trips in Malaysia was to the mystic island of Pulau Besar in the state of Melaka, better known as Malacca to most English-speaking people. 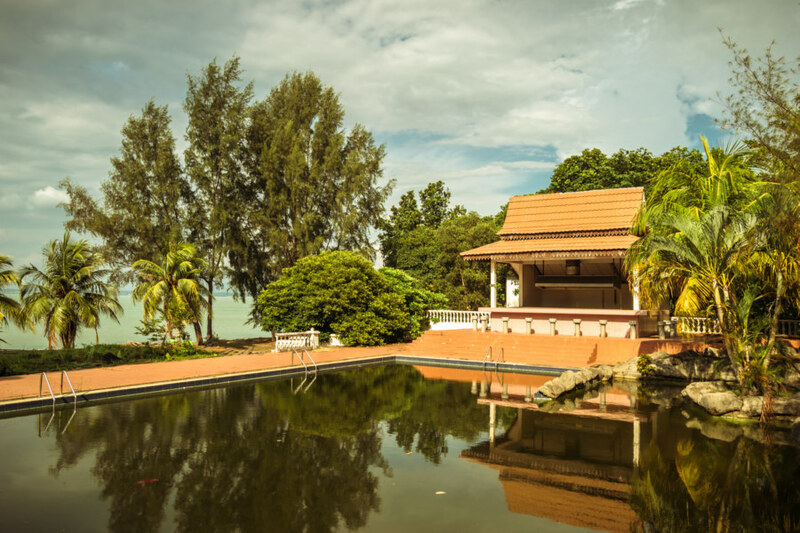 Situated in the Strait of Malacca, one of the world’s most important shipping lanes, the small island of Pulau Besar is steeped in myth and legend. 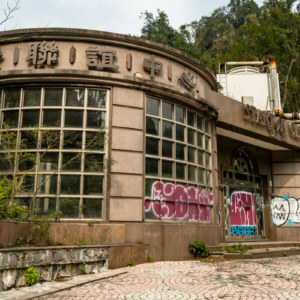 It is also widely considered to be haunted—which partly explains why most of the island is abandoned. 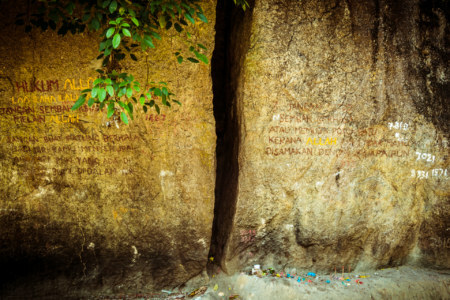 Most, if not all, of the spiritual practices commonly performed on Pulau Besar are considered objectionable and even downright deviant by the Malaysian religious authority. Consequently, the state has undertaken several initiatives to effectively sanitize and rehabilitate the island over the course of the last few decades. Their goal, insofar as I understand it, is to put an end to illicit forms of worship on Pulau Besar without completely alienating the Indian-Malaysian electorate. On the way to Pulau Besar. You can see one of the abandoned resorts to the right. 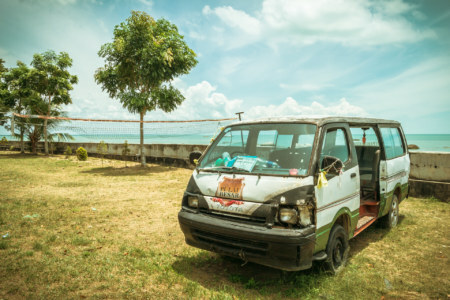 One of several taxis on the island. 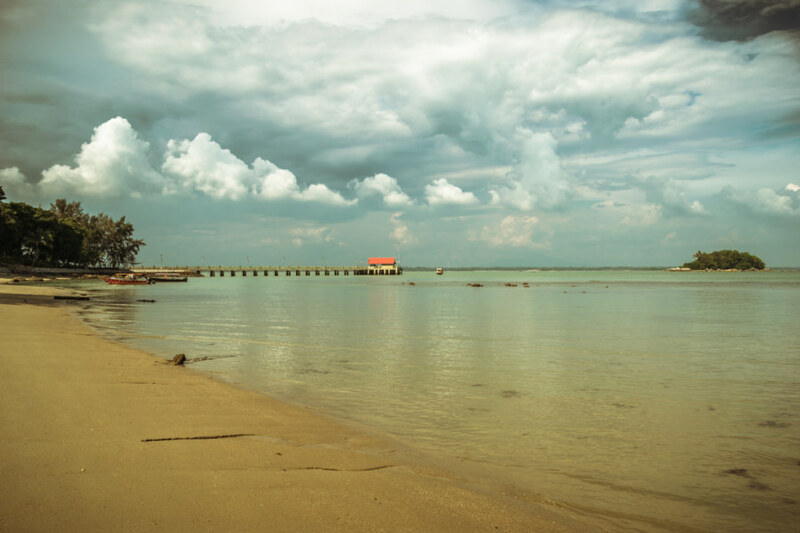 In the 1990s the Malaysian authorities attempted to develop the island into a tourist destination. 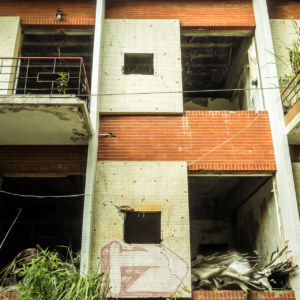 Residents were relocated to the mainland, permanent habitation was forbidden, and most of the island’s wild forests were cut down to accommodate new infrastructure, several resorts, and an 18-hole golf course. 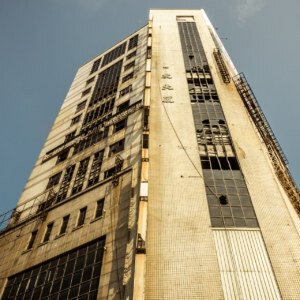 Most of these facilities are abandoned but still maintained to some degree. 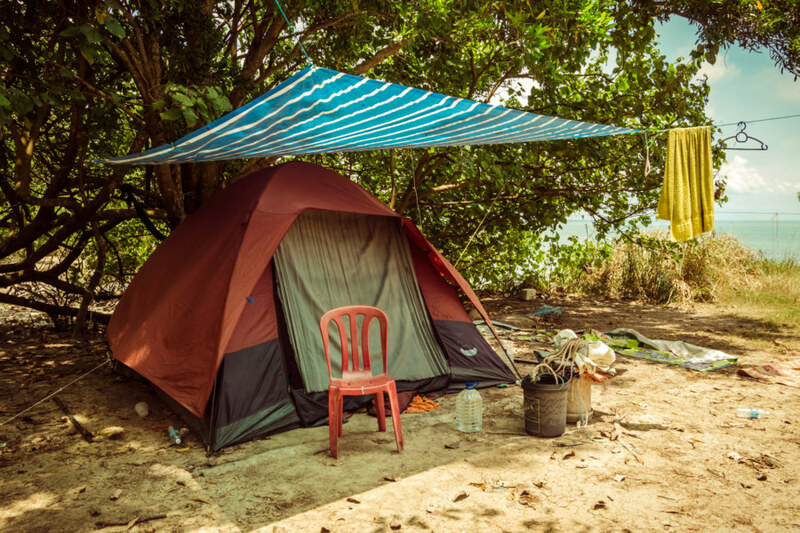 A rudimentary campsite on the eastern shore of Pulau Besar. Pilgrims and seers encamped on the eastern side of the island. 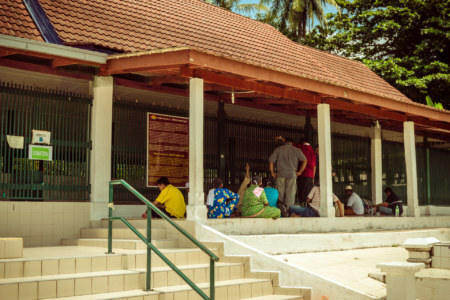 Pilgrims at the most famous tomb on Pulau Besar. 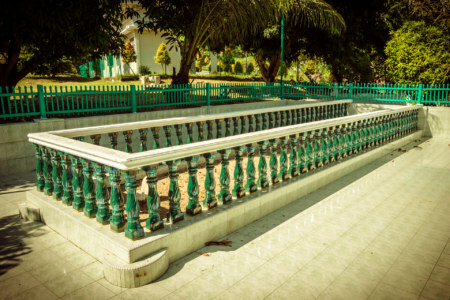 The most famous tomb on the island, that of Sultan Ariffin, is locked inside a steel cage, purportedly to preserve its historic value. Others tombs remain open to the public but I’ve read that a few were removed during the construction of the resort and golf course. 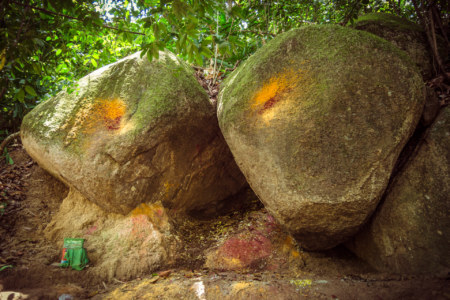 Signs nearby prohibit worshipping at the tombs, in the forest, or at any of the other holy places around the island, with stiff penalties for violations. I wonder if these decrees are ever enforced? 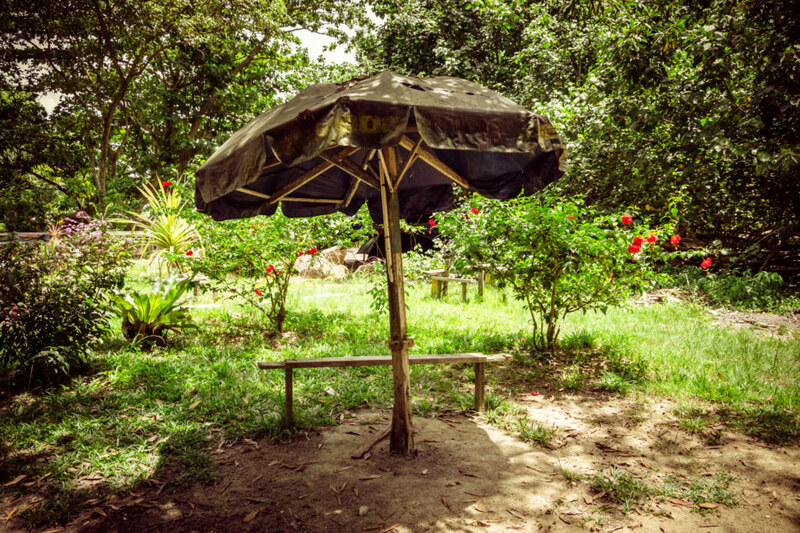 A decrepit umbrella on Pulau Besar. 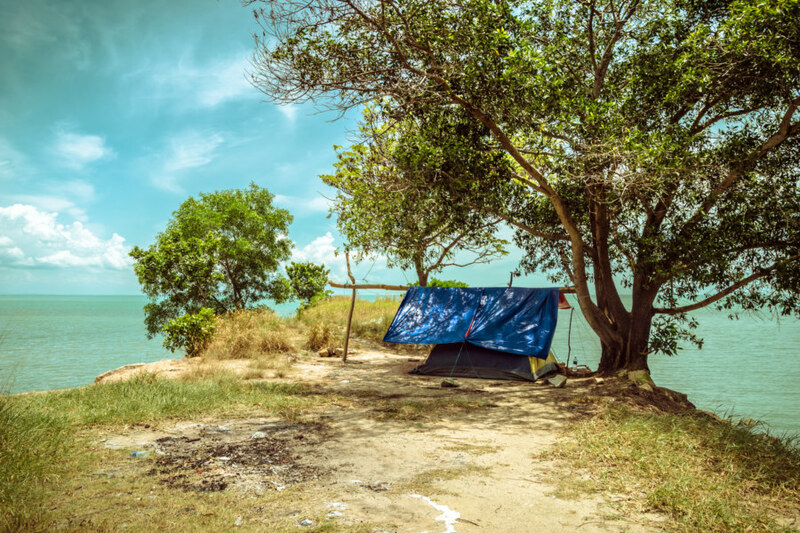 One of many isolated campsites along the eastern shore of Pulau Besar. 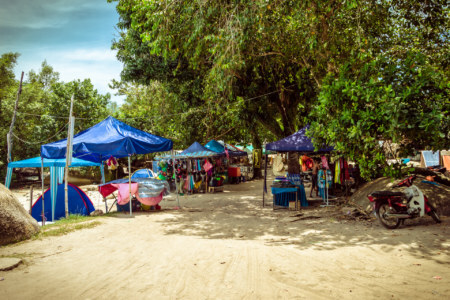 The campground on the eastern side of the island is home to dozens of tents and a small market selling basic food and beverages as well as spiritual paraphernalia such as incense and talismans. Some of the campsites looked like they had been there for quite some time. Most of the activity I saw was around the most famous tomb—apart from that I hardly saw anyone at all. 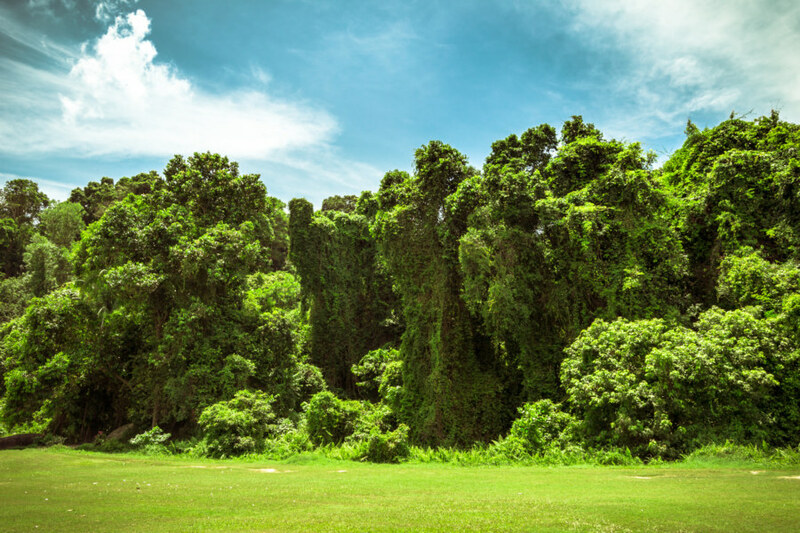 The mystic forests of Pulau Besar are filled with bewitching shapes and patterns. The clear area in front is part of the abandoned golf course that covers most of the island. Beyond the encampment the trail leading south eventually meets up with the island-spanning golf course. Here one will find an unmarked grave strewn with flowers. This might be the tomb that was supposedly removed during the construction of the golf course as it is right next to the putting green. There is a shallow muddy well nearby, also infused with mystic qualities. Supposedly if you reach your hands into the mud you might find rubies or old bones or something of that nature. It is an eerie scene: the primal jungle, voracious, looming over the parasitic golf course. A cryptic sign on Pulau Besar indicating the way to one of many forbidden places of nature worship. 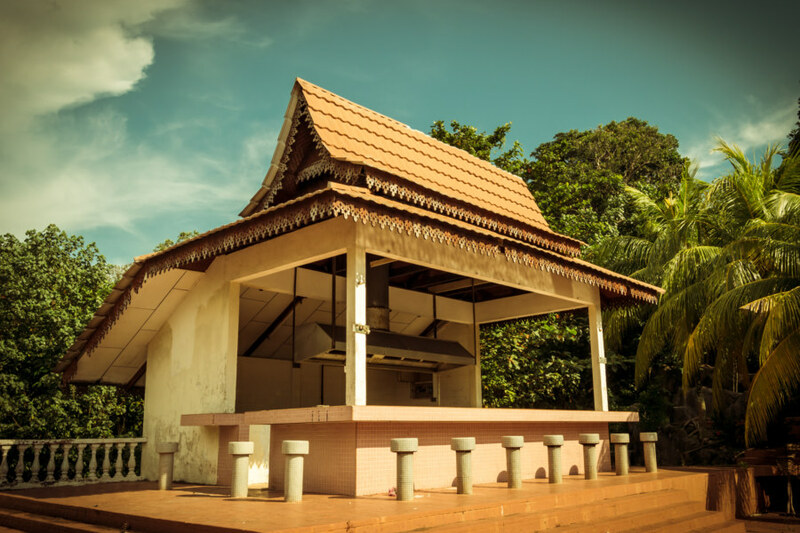 One of many nature shrines on Pulau Besar. I followed a short trail into the mangroves at the southern end of the island, startling a large monitor lizard along the way. Doubling back, I went up an incline and soon arrived at a distinctive rock formation smeared with dye. There was fabric wrapped around a tree stump in the Hindu style. Small brown lizards skittered into the underbrush at my approach. 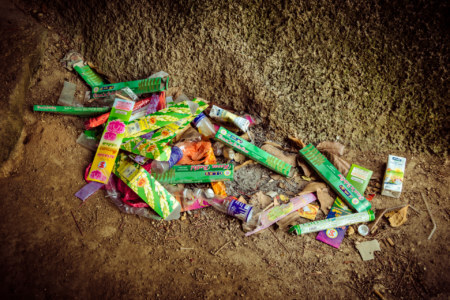 The ground was littered with incense and refuse. Several teenagers approached me on the putting green as I emerged from the forest. They offered to help me find the way to Gua Yunus, a cave on the southwestern side of the island. 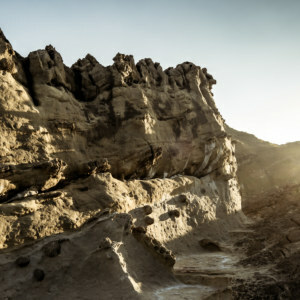 I was told the trail was long and treacherous, that only experienced guides knew how to get there, and so on. I refused, seeing no need for any help, at which point one of the boys brought out a mobile phone to call his father, a “tour guide”, who I am quite sure would have charged me for his services. I adamantly refused and continued walking, leaving the boys behind. What were kids doing out here anyway? Beneath the rocky overhang at Gua Yunus. Trash left behind at Gua Yunus. Gua Yunus wasn’t hard to find and the trail wasn’t long or treacherous. It wasn’t really that interesting either, nor was it much of a cave—just a rocky overhang by the seashore. What caught my eye the most was the collection of trash nearby. I was perplexed that people would come all the way out here to worship nature and then leave all their garbage behind. 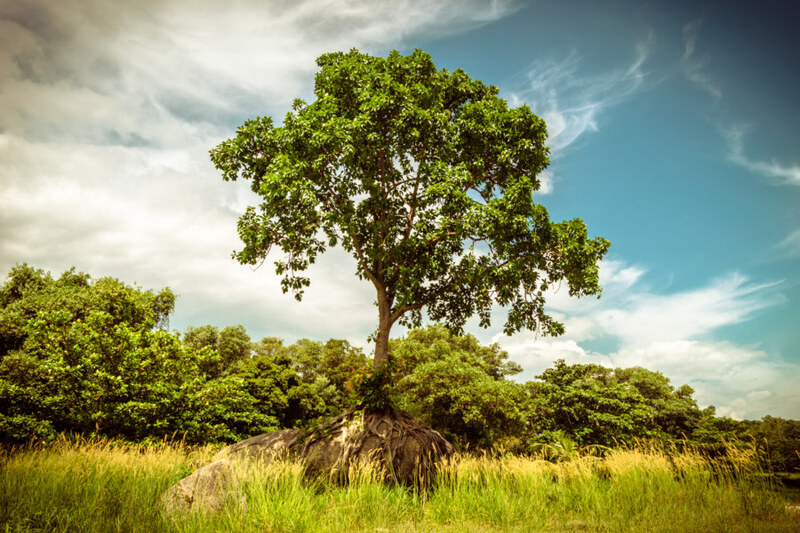 This beautiful tree is wrapped around a boulder on the western shore of Pulau Besar. 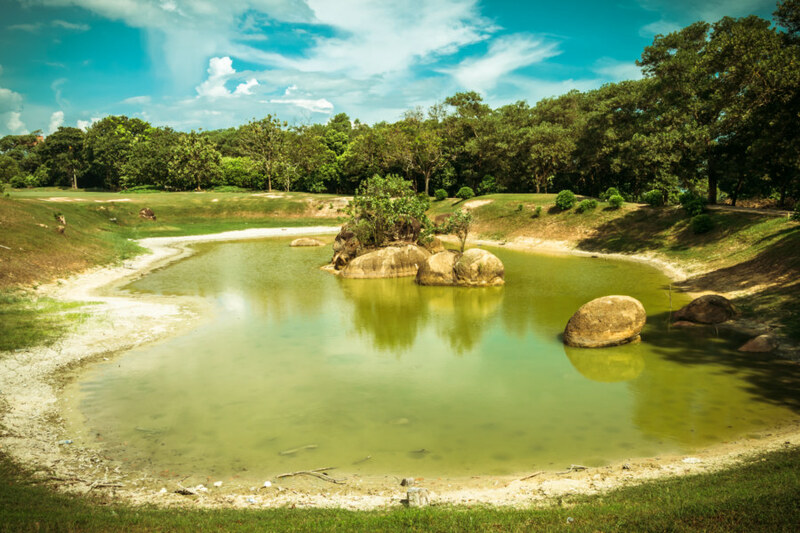 I wandered north along the western shore of the island, passing through the ever-present golf course on my way to the Marina Resort, the most extravagant of the abandoned sites on Pulau Besar. It was reputedly designed by a Spanish architect and looks vaguely like a Mediterranean seaside town. The entrance to Marina Resort, Pulau Besar. Unfortunately the guards were on duty and I wasn’t able to gain access. My exploration of the Marina Resort was thwarted by a security guard at the gate who denied me entrance and informed me that the resort wasn’t actually abandoned. 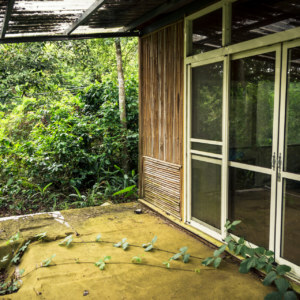 Many of the villas were occupied by people who worked on the island, groundskeepers and the like. 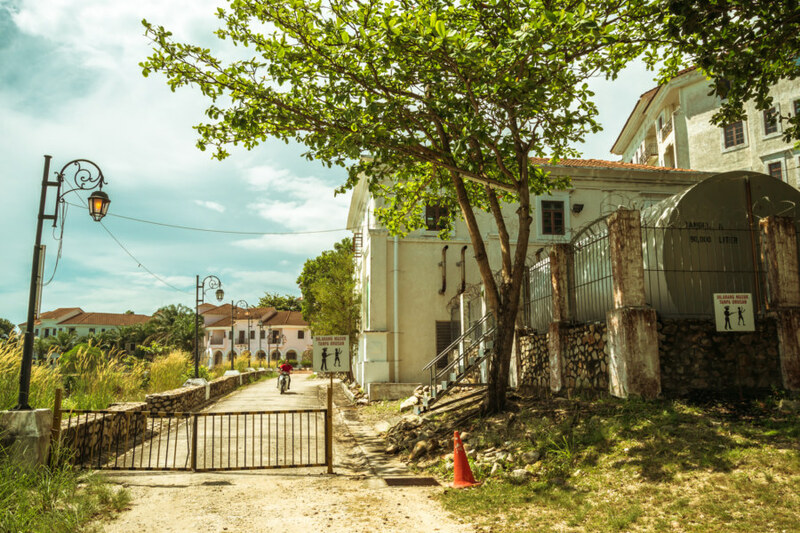 I would imagine that the resort is maintained and guarded mainly to keep squatters out. 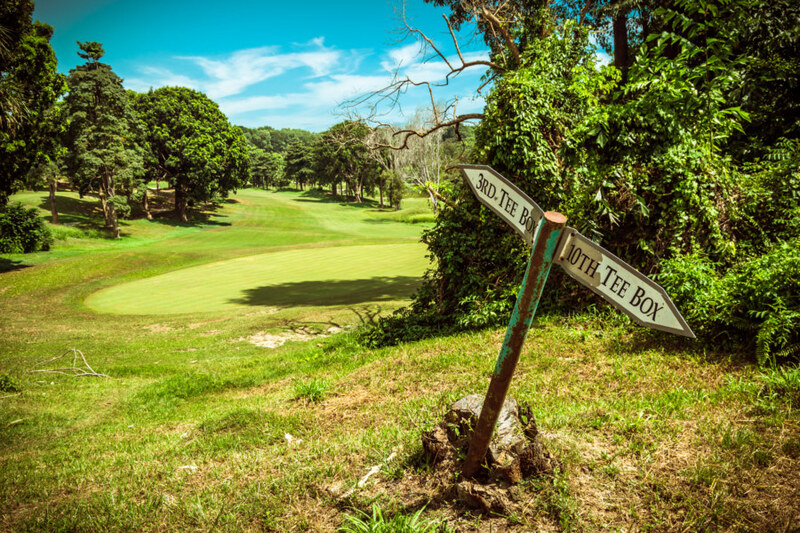 Signage on the abandoned golf course on Pulau Besar. I wonder when was the last time anyone played an actual game of golf here? Heading east from Marina Resort I walked along poured concrete paths linking different parts of the golf course that spread like a cancer across the holy island. Despite falling into disuse the golf course is neatly maintained, almost certainly as a pretext for upholding the prohibition on permanent settlement. The holy fairway. In an attempt to discourage spiritual tourism most of the island’s forests were cut down to install this useless golf course. 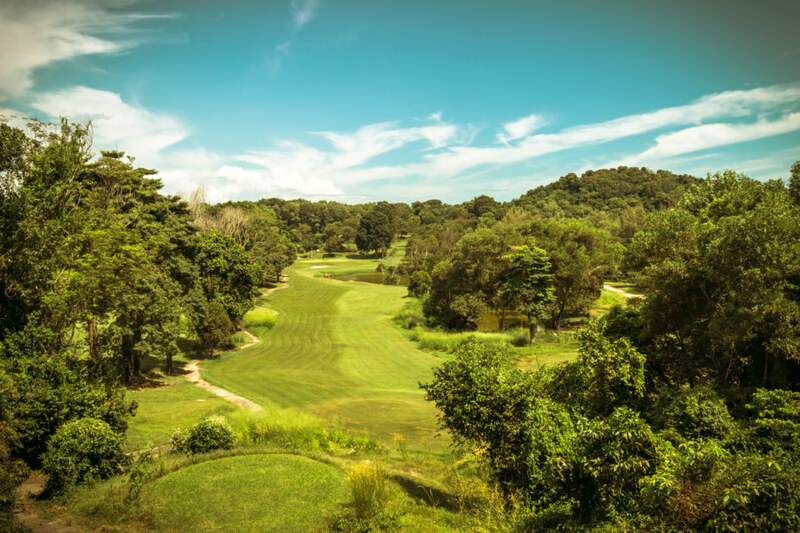 When was the last time anyone teed off on Pulau Besar? Who pays to have its fairways manicured? 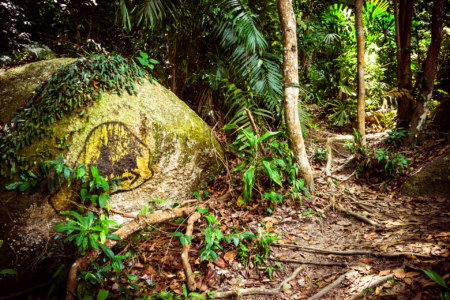 How long will it take for the jungle to swallow it up when the money runs dry? I was looking forward to seeing some big monitor lizards but there were none to be found. I took a small detour to have a look at the infamous “lizard lake” with its collection of mystic boulders (“skull rock” and so on) but saw no movement in the stagnant water. I retreated to the shade along the main path and did my best to avoid the many swarms of ravenous mosquitoes. Batu Belah, the tongue-split boulder at the highest point on the island. The tomb of Sharifah Rodziah. The length of the grave denotes spiritual stature. 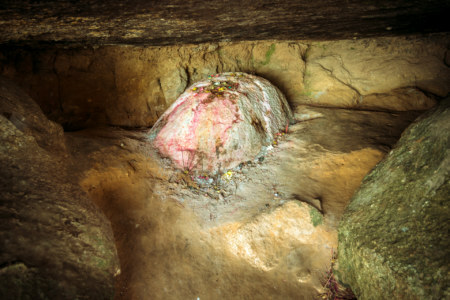 Batu Belah is a legendary stone located at the highest point on Pulau Besar. 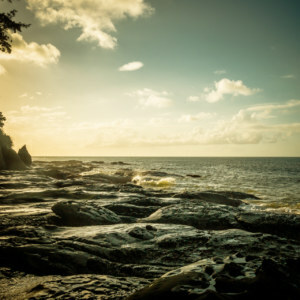 It can be found by climbing some stairs leading up from the trail running between Marina Resort and the jetty. The legend, as I remember it, is that a holy man demonstrated his spiritual powers by splitting a boulder into two pieces with his tongue. Nowadays pilgrims come to pray and leave offerings—including several live chickens that I found roaming around the area. 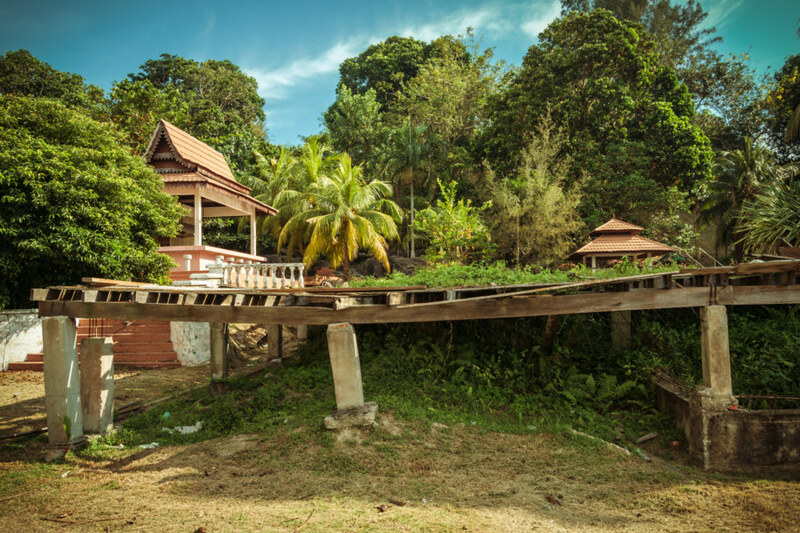 The deck at Putera Island Resort is falling into disrepair. 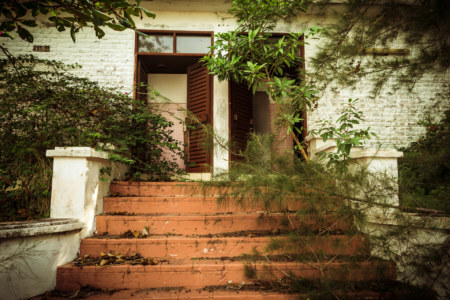 A first glimpse of one of the abandoned resorts of Pulau Besar. The view from one of the bars at Putera Island Resort, Pulau Besar. 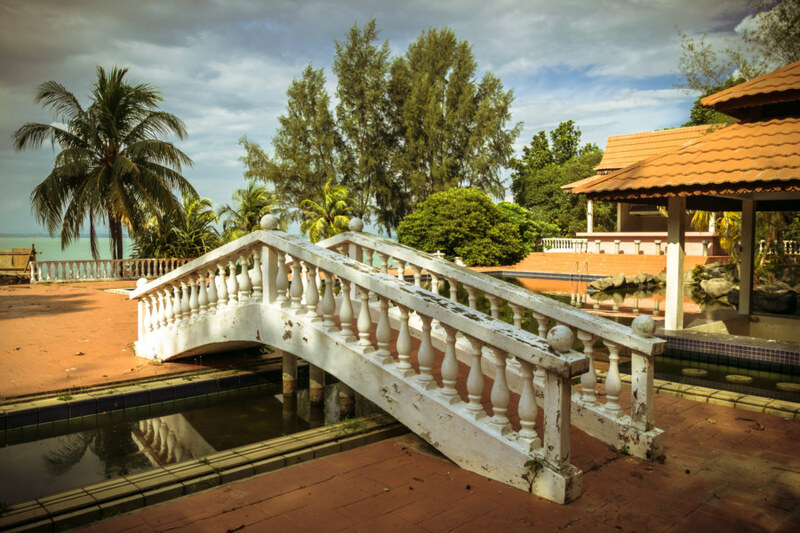 The second abandoned resort on Pulau Besar is along the northern shore, not far from the jetty. I did not have much time to explore as the last ferry back to the mainland was arriving soon. 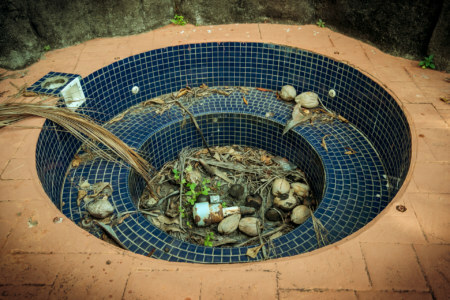 As such, I confined my explorations to the poolside area, which is just as well. It looked like there was construction going on further west, in the direction of some of the other resort facilities. I get the sense that the government has no problem treating Pulau Besar as a money pit as long as it marginalizes the pilgrims. 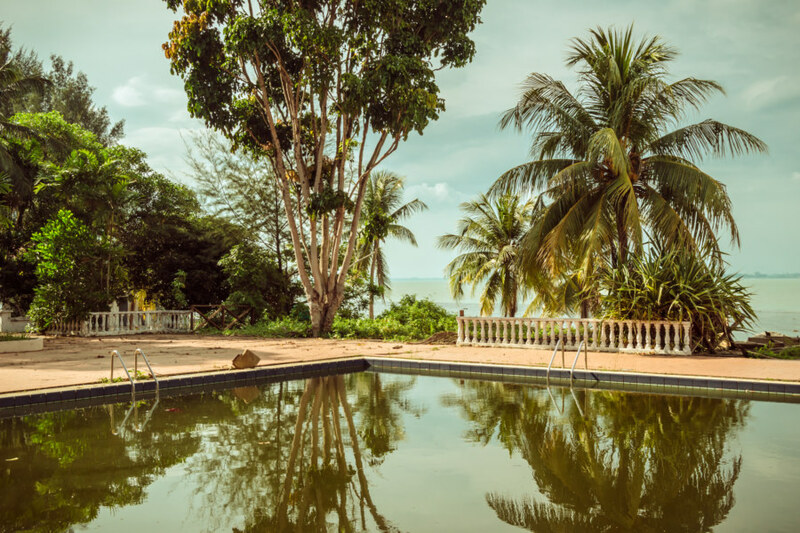 Reflections in the swimming pool at the abandoned Putera Island Resort, Pulau Besar. This is what happens when you leave a swimming pool to the elements. Curiously, the web site for Putera Island Resort is still online. It even looks like you could book a room if you wanted to—by bank transfer, no less. I wonder if anyone has accidentally planned a holiday here in the many years since the resort was shut down? Lounging at the poolside bar at Putera island resort, Pulau Besar. 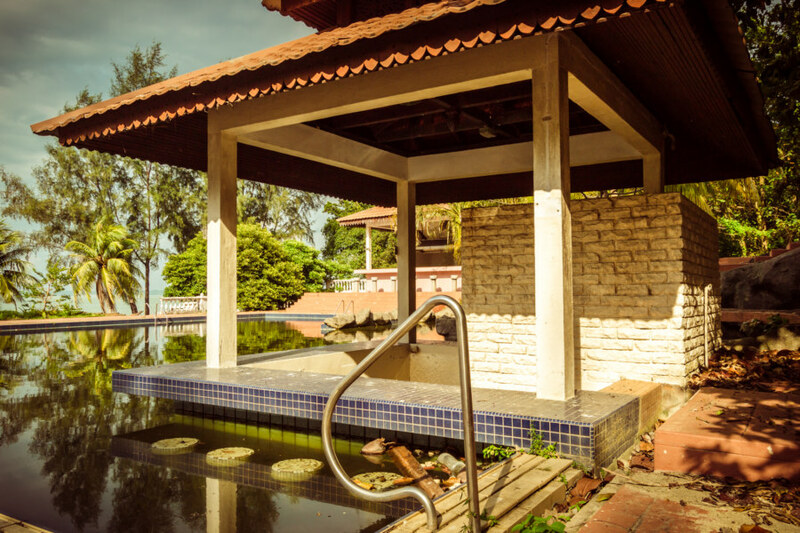 The poolside bar was one of the most interesting sights at Putera Island Resort. I have to wonder, did they ever serve alcohol? This is a holy island—visitor’s guides recommend that you refrain from eating pork the day before boarding the ferry and women are advised to dress modestly. It probably goes without saying that there is no alcohol and no dogs permitted on the island. 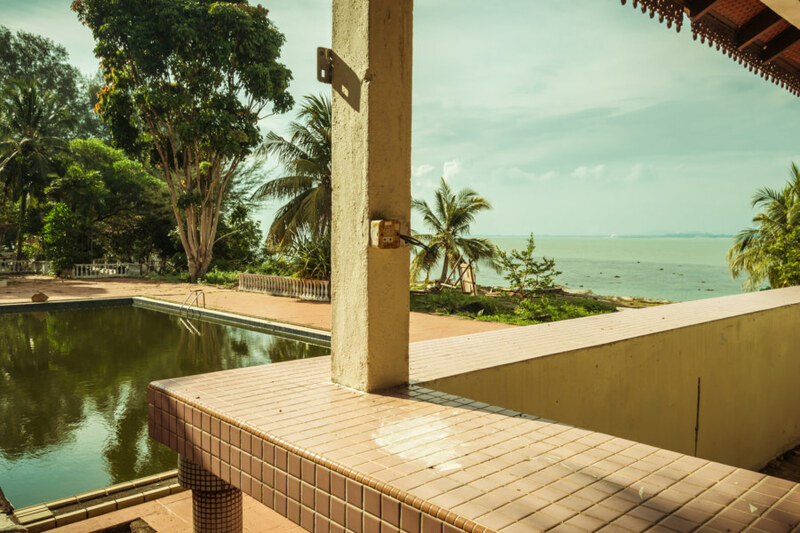 The abandoned Putera Island Resort, Pulau Besar. 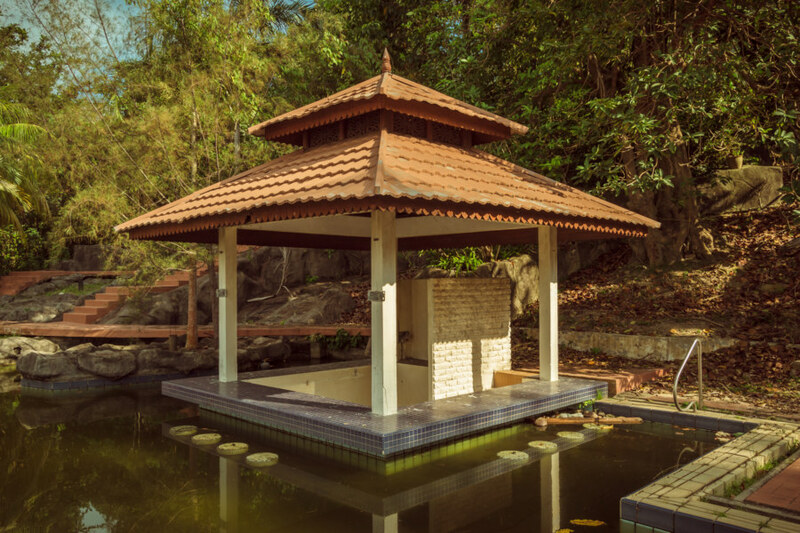 Take a dip in the hot tub at Putera Island Resort! 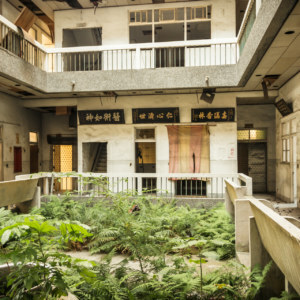 Overgrown change rooms at the abandoned resort. I saw nothing supernatural in my time on Pulau Besar. 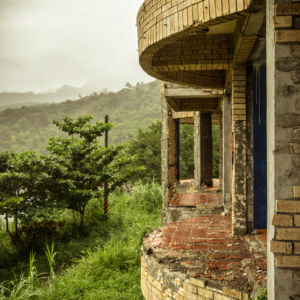 There is an almost endless number of anecdotes about boats capsizing, apparitions in the forest, spiritual visitations, and the like, but I never felt particularly creeped out like I have at some of the other ruins I have explored, not even at the abandoned resort. 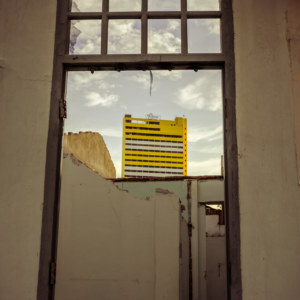 It was run-down and falling apart but there was nothing particularly spooky about roaming around under the blazing tropical sun. The poolside bar at Putera island resort. Mostly I just felt a deep sense of absurdity as I roamed around Pulau Besar. It is a ridiculous place at the crossroads of tradition and modernity. Neither force can claim victory here. For me, the absolutely useless golf course is the most poignant symbol of this collective failure. 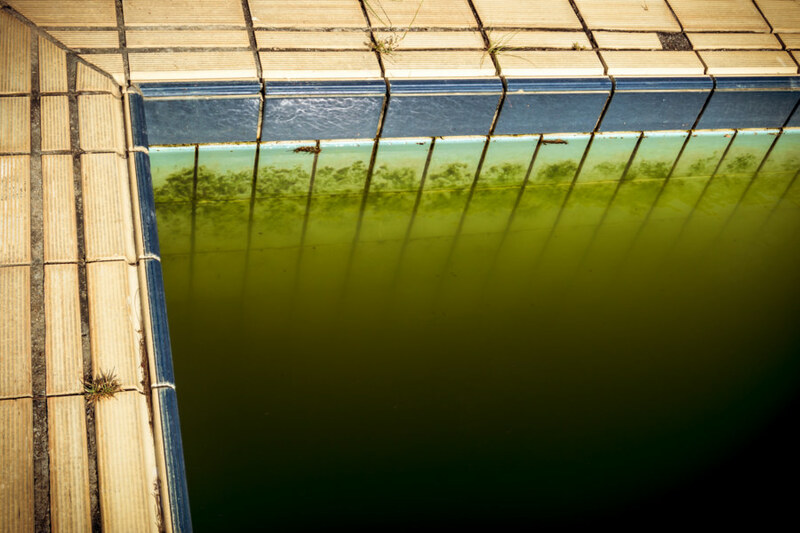 Another look across the festering pool at the abandoned Putera island resort. I might not have seen everything I wanted to see on Pulau Besar but I am still glad I went. The more customary tourist destinations in peninsular Malaysia weren’t really my style. 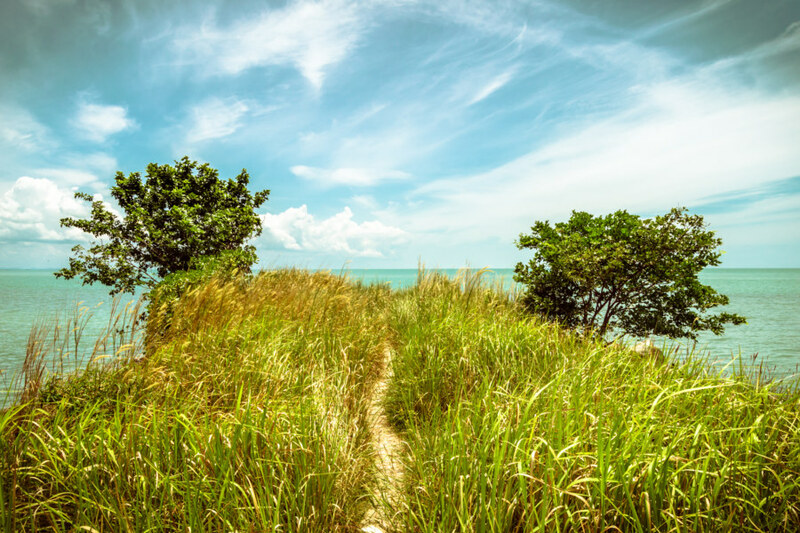 I like getting off the beaten trail—and so I am glad I took a chance on the mystic island of Pulau Besar, one of the weirdest places I have had the pleasure of visiting in southeast Asia. One last look at the mystic island of Pulau Besar. 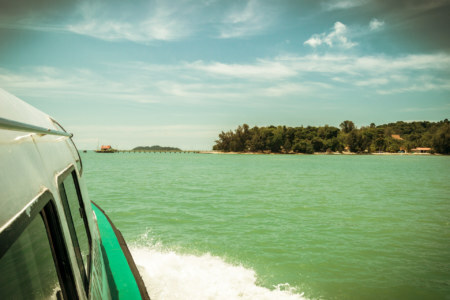 Getting to Pulau Besar is surprisingly easy. The ferry runs from Anjung Batu on the outskirts of Malacca City every two hours or so. There is a public bus running along the nearby highway but you can just as easily hire a taxi to take you to the ferry for about 20 or 30 RM from central Malacca. Once at the jetty you will need to purchase a round trip ferry ticket for approximately 14 RM. The rest is up to you. The island’s facilities consist of one hotel (with a cheerful sign outside, “yes, we’re still open”, though I wouldn’t recommend staying overnight), a couple of buildings housing basic restaurants and snack stalls, one public toilet (“tandas awas”), and an ad hoc marketplace down in the camping area. Cold drinks and snacks are also sold at the tip of the jetty. To read more about Pulau Besar check out this travelogue or peruse more local perspectives here, here, and here. Good job as it was very infomative. Thank you. I ran the shop in the now-abandoned resort for a short while in 1996 and made batik T-Shirts there. There were still large numbers of pilgrims arriving every day despite the attempt to change the island’s use. They were associated with Silat martial arts and a blind mystic, who had preached against the Mahatir UMNO government. He was apparently incarcerated on Malaysia’s Devil Island near Penang. We used the golf cart at one stage to transport a giant python away from the resort that had just eaten a tom cat. The staff wanted to move it in case it took a child next but were aghast at the idea of killing it. Alcohol had been served but the owner changed the bar to fruit cocktails only, making it less than attractive to Singaporeans and visiting airline staff on stopovers. Added to that, the white sand beaches of the brochures were actually in Langkawi, so guests would be annoyed once they’d searched and found the real offering. I met an engineer leaving the island, who had been part of the golf course construction, who was on the verge of a breakdown. He swore not to return, having been involved in forest/grave clearance, claiming apparitions and haunting. Nice photos.But herein some clarifications.Myself?….an Indian Muslim ,Singaporean, who have studied in India,Singapore and UK.And ah,been to 60 odd countries and lived in 10 of them.Including war torn Cambodia and Papua New Guinea. My first visit to this island was in the 70s….when Chinese Malaysians were seen hovering this spot for 4D luck.Subsequently,my other visits only began in the 2000s.—-was actually ‘introduced’ to this place by a Hindu Singaporean.We went back packing on a shoe string budget.Then I fall in love with this island. I am not exactly a religious sort of fella but loves the outdoor life.Having seen action in some of the far flung ‘godforsaken’ places on this earth.So,what gives and floats my boat here eh!…..There is something serene about this place.No wonder ancient travelers found this place ‘kosher’ too. Ah,about the clarification thingy.Yes,main stream Malay Muslims do not encourage prayers sessions practiced here.But what is practiced here is part and parcel of a larger system.Its called ‘SUFISM”…….just Google for more info. Unlike in North India where the advent of Islam came about through military adventures and conquests.The Southern part of India was connected to the West and Arab civilization through trade.As an example one of the oldest mosque (Palaiya Jumma Palli -628 AD) in the world outside Arabia is thus found here–right down in the present Tamil Nadu.In fact ,the renown ancient Arab traveler Ibn Battuta-1304AD(Moor actually)notes the highest numbers of Arabs were residing and trading in S.India.Those Arabs are the Yemenis of today and the same kind of “Syeds” you find in Malay Archipelago. Now almost all Muslim majority towns in Tamil Nadu were gifted to by Hindu Maharajas-for curing some of their mysterious ailments by these Muslim mystics……and most of those Muslims were Sufis.The most well known of these is Nagore Dargah in South and Ajmer Sharif in North India.An exact replica of Nagore Dargah was built in Singapore in 1828AD—just years after Raffles landed.Currently declared a heritage to be preserved.Not surprisingly,more than 70% of the pilgrims to here are non Muslims.Hence one can summaries how Islam spread in S.India and then extended its wing to the Malay Archipelago. Thanks for posting this. I wasn’t aware that this existed – I’ll definitely see if I can head over there when I’m in the area. 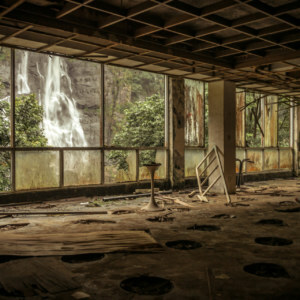 About the abandoned resort. How receptive do you think the guard would have been to giving you a “tour” if a few MYR changed hands? I enjoyed the visit , while did not have a chance to stay overnight. If you like exploring the unbeaten tracks. Very interesting that someone still pay to maintain the golf course grass, and clean the resort while no guests around. There is another just built resort, but also was not in operation when we visited the island. May be going back with my kids next month in a weekend trip to get some better understanding. Good one. It’s an island filled with mysteries for centuries. Do not belittle any aspect of the island. It is those who are ‘beneath the earth’ who are keeping the island alive.